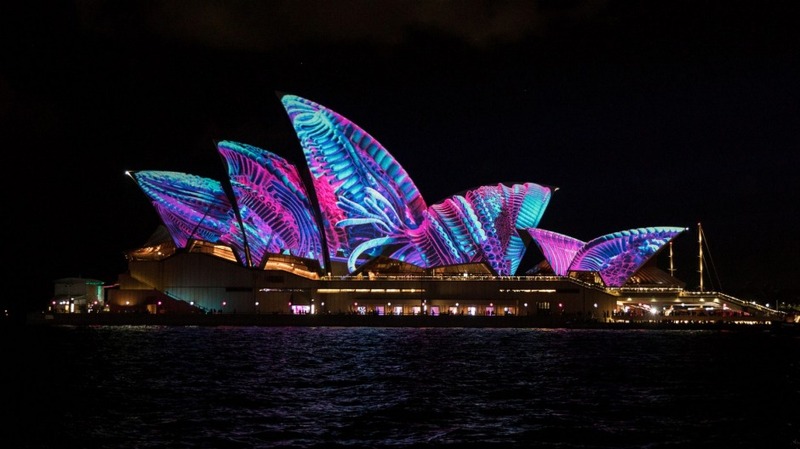 Glowing cocktails, neon dips, rainbow cakes – they'll all be on show at this year's Vivid Sydney from Friday, May 25 to Saturday, June 16. Here's our pick of where to eat and drink around town during the festival. The Museum of Contemporary Art will plunge into a luminescent world with two pop-up bars offering glowing drinks and mulled wine. Bombay Sapphire x MCA Pop-Up Bar, Wed, Fri and Sat during Vivid, 5-9pm (closed May 25, June 1 and 6). Graze MCA Vivid Pop-Up Bar, May 16 – June 16, 5.30pm – late. MCA, Circular Quay, mca.com.au. Take your pick, Chatswood: Mary's burgers or Black Star Pastry's strawberry watermelon cake (and a creepy concoction called "colour change tea" that changes from deep blue to pink), all without crossing the bridge. Chatswood Light Market, Chatswood Mall, May 25 – June 16, 5.30 - late, vividsydney.com/event/light/light-market. Get your glow on at the sky-high O Bar & Dining with fluorescent cocktails from servers wearing glow-in-the-dark shoes. Order two "limelight" cocktails ($21 each, with Four Pillars gin, Campari, citrus extract and kaffir lime leaf) for a free tapas plate while taking in the harbour panorama. O Bar and Dining, 47th floor, 264 George Street, Australia Square, obardining.com.au. Sign up for an immersive night of food, wine and provocative thinking with two "enlightenment" dinners as part of the interactive Hard Things to Talk About dining series, developed by conceptual agency Glider. You'll hear from NASA "visual strategist" Dan Goods, entomologist Tanya Latty and philosopher Matt Beard, alongside performers Lee Serle, Holly Durant and Samuel Harnett-Welk and more. 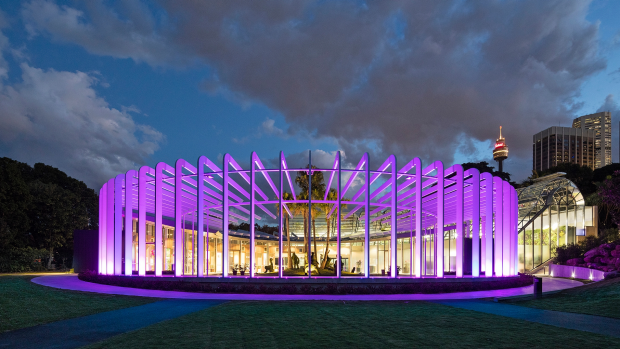 May 26 and June 2, Calyx, Royal Botanic Garden, hardthingstotalkabout.com. Book two ($55) or three courses ($70) at Milsons Point restaurant The Deck at Luna Park to receive free parking and a free ride ticket (our pick is the ferris wheel, which will light up with more than 3000 bulbs). Kids welcome. The Deck at Luna Park, Milsons Point, thedecksydney.com. A trio of neon dips? Sounds weird, tastes good. 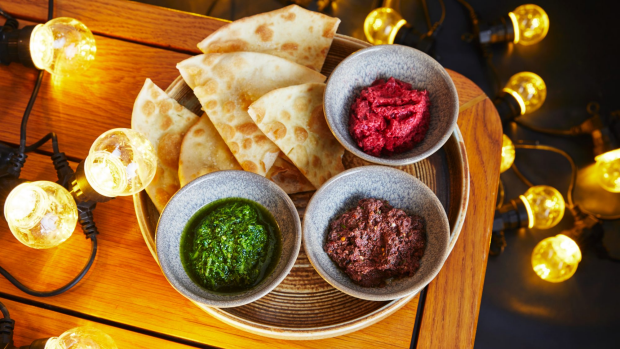 Opera Bar's beetroot hummus, kalamata tapenade and rocket and spinach pesto will keep you snacking throughout the evening, right in the middle of the festival action. Opera Bar, Macquarie Street, Sydney, operabar.com.au. Crank up the luxe this year and book one of Pier One Hotel's igloo pop-ups, which guests can hire for up to 10 people ($400 for minimum three hours). With fairy lights, fireplaces and even a hot tub option, these private perches won't leave you out in the chill. Or, if your own private igloo sounds a tad excessive, get in the spirit at Pier One Bar instead, with a Lillet Blanc mint-infused spritz in a light-up glass globe alongside cocktails spiked with Blue Curacao, Midori and purple Ink Gin. Pier One Hotel, 11 Hickson Road, Walsh Bay, pieronesydneyharbour.com.au. 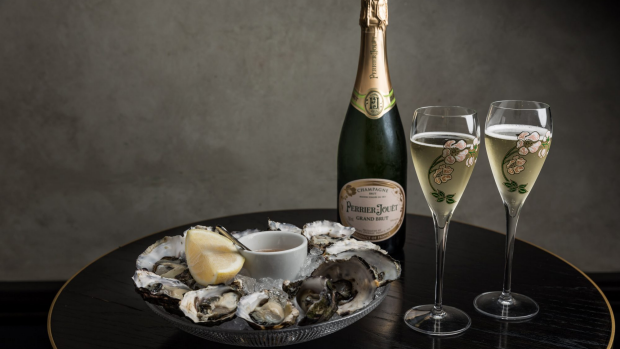 From May 31 until July 26, QT Sydney's Gilt Lounge is offering free champagne and canapes every Thursday from 5.30-7.30pm. From Friday May 25 until June 4, the team behind Newtown bar The Midnight Special will transform the northern foyer of the Opera House Concert Hall into Goldie's Music Hall. The pop-up will celebrate the golden era of '60s and '70s funk, soul and R&B, complete with bloody mary oyster shots and Alaskan king crab rolls. Goldie's Music Hall pop-up, Opera House Concert Hall northern foyer, sydneyoperahouse.com/events/whats-on/vivid-live/2018/goldies-music-hall.html. Need a fast feed? 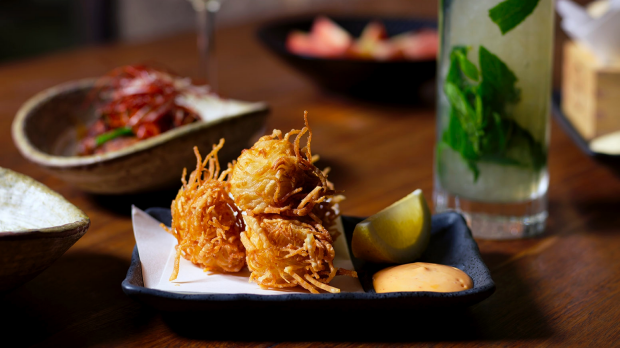 Head to Gateway Sydney for a hub of dinner deals. You'll find free kids' sliders with every adult meal at Schnitz, or mulled cider at Four Frogs Creperie, alongside a lemon meringue martini at Salt Meats Cheese. Be quick or you'll miss Messina's limited edition "candy Warhol" flavour with raspberry jellies, passionfruit marshmallows and violet crystals – it's available the first week of the festival only. 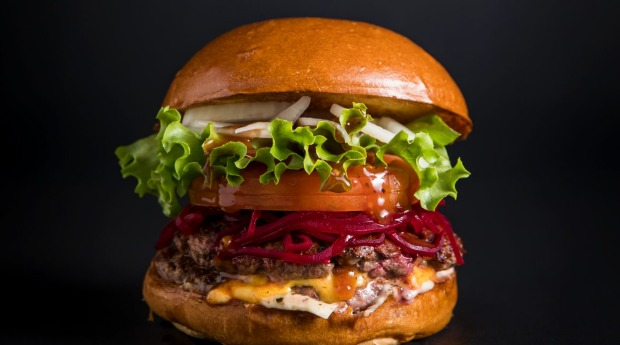 Or – if you're heading past Grosvenor Place – drop by the swanky new digs of Black Label by Burger Project from Monday, May 28 to try one of seven premium burgers, including the "native" with a kangaroo pattie and bush tomato sauce; the "black label" with Cape Grim beef and triple-smoked bacon mixed pattie; and a vegan option with chickpea and zucchini. Gateway Sydney, Alfred Street, Sydney, vividsydney.com/deals. Burger Project Black Label, Grosvenor Place, 225 George Street, Sydney, burgerproject.com/blacklabel. Can't schlep it to the city? Head to the Harold Park Tramsheds, which will be awash will colour for the festival. Tuck into Garcon's cheeseboard with wine or beer (or a boozy affogato) while watching screenings of vintage films, or enjoy $5 drinks at Butcher and the Farmer during happy hour (4-7pm). Need to grab and go? 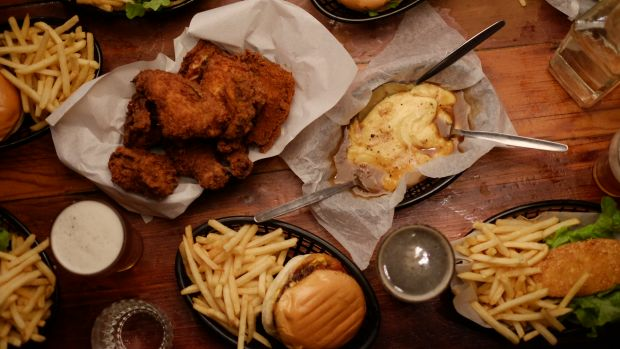 Belle's baller deal includes a bucket of chicken and four tinnies or a carafe of wine for $89. Harold Park Tramsheds, 1 Dalgal Way, Forest Lodge, tramshedssydney.com.au. Eat up early at Sake Restaurant & Bar, which will open at 5pm especially for the festival. Its $55 Vivid menu includes hiramasa kingfish, prawn shumai, shiokoji chicken and tofu cheesecake. Sake Restaurant & Bar, 12 Argyle Street, Sydney, sakerestaurant.com.au. How do $8 negronis sound? Head to Salt Meats Cheese in Circular Quay on Sunday, June 3 to enjoy them on tap, alongside $5 pizzas (margherita, diavola and truffle) and $10 pastas (pesto gnocchi, ravioli with butter and sage and slow-cooked lamb ragu). Can't make it along? The $8 negronis will be on tap from June 4-10 as well. June 3, 12-4pm, Salt Meats Cheese Circular Quay, Level 2 Gateway Building, 1 Alfred Street, Circular Quay, saltmeatscheese.com.au/circularquay. Nab one of the best seats in the house and enjoy a G&T with a twist at Bar Patron by Rockpool (grapefruit, tequila, tonic and fresh lime). Dine a la carte, or book a Vivid set menu of tacos and enchiladas for $50 at 5pm. 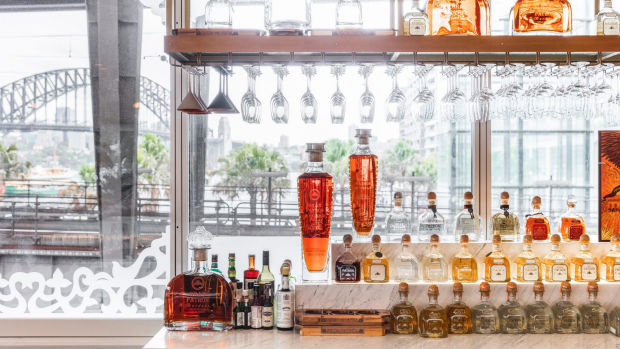 Bar Patron by Rockpool, 2 Phillip Street, Sydney, barpatron.com.au. If you're heading to Harbourside in Darling Harbour, pick up one of the $30 specials at Dragon Boat, Kazbah, Zaaffran or Rashay's. Or check out the new flagship 550-seater Fratelli Fresh at the new International Convention Centre Sydney, where you can pick up a takeaway picnic basket, kick back in the beer garden or enjoy $5 negronis, martinis, spritzes and pizzas. Harbourside Shopping Centre, Darling Drive, Sydney, harbourside.com.au. Fratelli Fresh, International Convention Centre, Sydney, fratellifresh.com.au. Mmm is for Moet, amirite? If champagne is your mood, mosey on down to Kendall Lane to check out new terrace bar Mrs Jones, upstairs in the Orient Hotel. 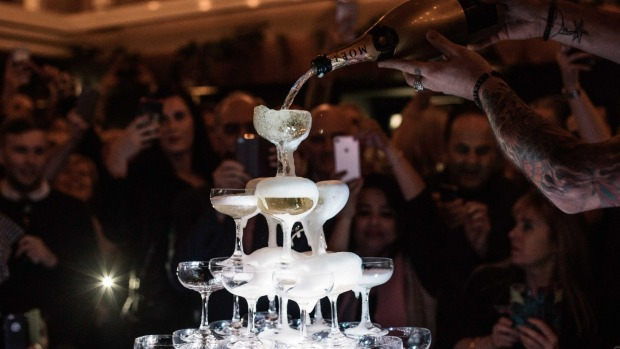 Named after Jane Jones, the original licensee in 1897, the venue will host an overflowing Moet & Chandon glass champagne tower every Thursday during the Vivid festival. Mrs Jones, corner Kendall Lane and Argyle Street, The Rocks, mrsjonesbar.com.au. For dinner with a view, head to the 36th floor of the Shangri-La Hotel Sydney for Altitude's sky-high six-course tasting menu overlooking the Sydney Opera House. 6-10pm daily during Vivid, $170 per person (or $235 with wine), Altitude, Shangri-La Hotel Sydney, 176 Cumberland Street, Sydney, shangri-la.com/sydney/shangrila/offers/details/dining/vivid-dinner-at-altitude/. 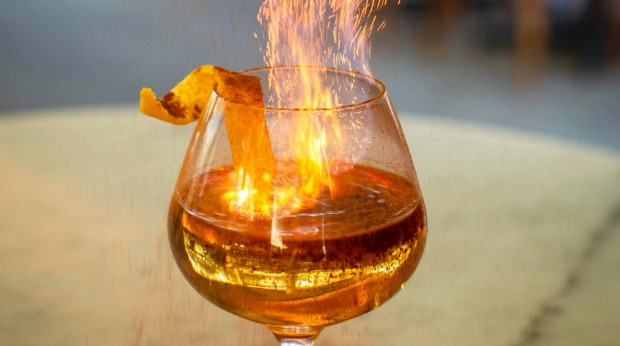 Here's a delicious way to beat the chill: a flaming orange winter spice cocktail at Barangaroo's love.fish. Tying into the festival's fire theme, the warming $18 brew is essentially a hot toddy with rum, orange jam, cinnamon, cloves, star anise and wattle seed. Plus fire! Wulugul Walk, 7/23 Barangaroo Avenue, Barangaroo, lovefishbarangaroo.com.au. Did someone say glow-in-the-dark fairy floss? It's available at Barangaroo's Banksii Vermouth Bar & Bistro for $10 on weekends throughout the festival. Banksii, 11/33 Barangaroo Avenue, Barangaroo, banksii.sydney. Get in early for a 5pm feed at Rockpool Bar & Grill with their two- and three-course set menus ($69, $79, available from 5pm daily), including Blackmore wagyu bresaola and a 250-gram Cape Grim grass-fed fillet. Oh and a special Vivid margarita, made with tequila, myrtle shrub and lemon juice, all topped with a plume of native mint bubbles. Rockpool Dining Group stablemates Jade Temple and Spice Temple will also offer three-course set menus ($45-$49). Rockpool Bar & Grill, 66 Hunter St, Sydney, rockpoolbarandgrill.com.au. Put your thinking cap on for "future of food and drink", an ideas panel about all things food and booze featuring panellists such as chef Mitch Orr, food photographer Nikki To and Young Henrys brew masters, and moderated by food writer Maggie Scardifield. Sunday, May 27 at 3pm, $45, Vivid Ideas Exchange, Museum of Contemporary Art, Level 6, Terrace Entrance (Circular Quay West Side), Sydney, vividsydney.com/event/ideas/future-food-and-booze. Hacienda bar is offering a trio of colourful red, green and orange cocktails to sip on while enjoying those impressive harbour views. Feeling famished? Book in at sister venue Q Dining for a three course $79 menu, including pepper-crusted lamb rump and merinque, wattleseed cream and passionfruit sorbet. Hacienda, 61 Macquarie Street, Sydney, haciendasydney.com.au. Not to be outdone, Solera Bar has joined in on the cocktail action, creating a spin on a gin sour that nods to the building's history. 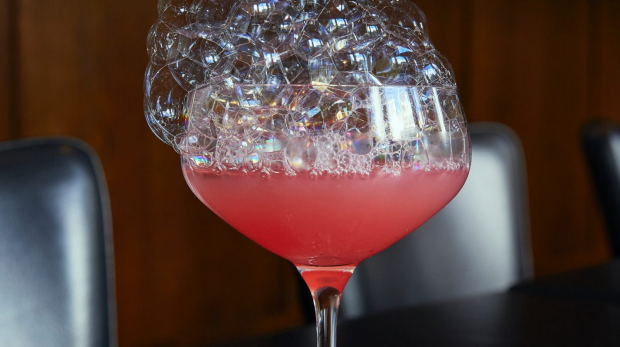 Called "the gasworks", the drink will be served in a smoky goblet with a light-up ice-cube, popping candy and rose petals. Available only during Vivid. Solera Bar, 336 Hickson Road, Millers Point, solera.bar. Rainbow cheesecake? 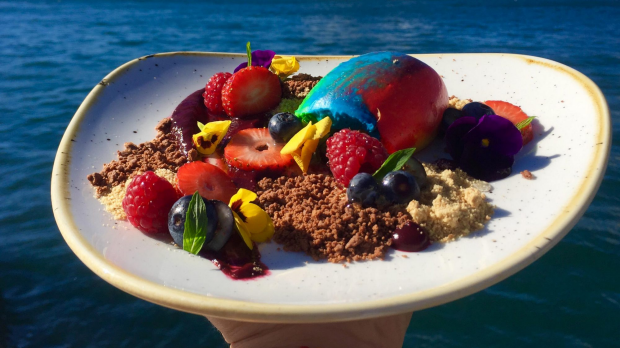 Yep, Endeavour Tap Rooms is going there just for Vivid – complete with Tim Tam crumble, blueberry coulis and vanilla syrup. Endeavour Tap Rooms, 39/43 Argyle Street, The Rocks, taprooms.com.au. It's music + snacks + drinks for the next three weeks at The Dolphin Hotel's aperitivo hour in Surry Hills. The pub's wine room will present menus from Pasi Petanen, fermenting guru Adam James (that's Rough Rice for all you Insta followers) and the venue's own kitchen, alongside DJ residencies. Until May 31 with Pasi Petanen; June 3-7 with Adam James; June 10-14 with the wine room kitchen (5-7pm) at The Dolphin Hotel, 412 Crown Street, Surry Hills, dolphinhotel.com.au. Grain Bar will glow blue this year, serving up a transparent "ghost of Mary" cocktail made with tomato consomme. After something more substantial? Sister venue Mode Kitchen & Bar will host a three-course wintry dinner menu for Vivid ($78 per person, free parking), with hearty Rangers Valley wagyu cheek and wood-baked radicchio. The star of the night is head chef Francesco Mannelli's "glow" pavlova. Four Seasons Hotel, 199 George Street, Sydney, fourseasons.com/sydney. 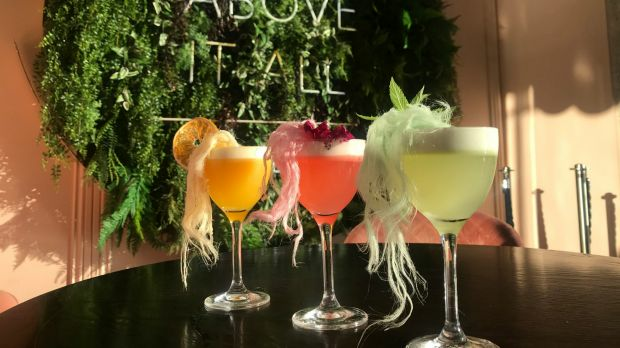 You read it right – follow a trail of cocktails, from booze importer SouthTrade International, for a taste of their signature labels mixed expertly behind the bar. Stop by new whisky bar The Doss House to try a 78 Degrees Gin "baked apple sour", laneway spot Three Bottle Man for a Starward whisky-heavy "stars in their eyes" and Nola for a Tito's vodka-spiked "Lafayette highball". Customs House and Zephyr are offering special Vivid tipples, too. Start at The Doss House, 77/79 George Street, The Rocks, thedosshouse.com.au.